We represent Owners of businesses based in Connecticut and New England in the $100,000-$10,000,000 price range. We are also one of the few business brokers in Connecticut licensed to handle real estate as part of a business transfer. Since starting in 1981, we've closed on over 650 sales of Retail, Service, Liquor, Food, Manufacturing and Wholesale companies. Our office has 5 associates with over 75 years of combined experience in business sales. Most buyers of small businesses are local, and our depth of contacts with prospects and professionals is unmatched. We will customize our marketing approach to your business to target the most likely buyers and to protect your confidentiality. Buyers like to work with us because of our 30+ years’ reputation for integrity, fairness and competence in guiding them through each stage of a business purchase. 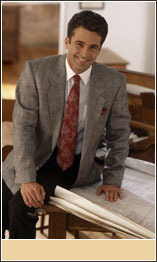 We will gladly furnish client and professional references. Alicia Larson – Co-Owner since 1992. Bill Ostrander – Brokering since 1986. 2009. Owned plastics manufacturing company. Business Auctioneering and Real Estate background. related to mergers and acquisitions. David Larson is the President and founder of Larson Associates (1992) and was partner in its predecessor, Larson & Skiba Associates (1981). With over 30 years of experience in guiding buyers and sellers of businesses, he is perhaps Connecticut's most recognized small business intermediary. He has been a featured speaker at outplacement agencies, networking groups, and colleges on topics related to buying a business or franchise. His focus is service, distribution and manufacturing businesses valued between $500,000- 10,000,000. Dave's business experience also extends to personal investments in franchised restaurant, retail store, and ownership and management of several commercial and residential properties. Prior to going into business for himself, he served in various actuarial assignments at CIGNA Life Insurance Company in Bloomfield, where he earned an Associateship designation in the Society of Actuaries in 1975. Dave graduated from Tufts University in 1971 with a Bachelor of Science in Mathematics. He has served as Vice President and member of the Board of Directors for the New England Business Brokers Association 1992 – 1994, a member of the Board of Directors of the Business Brokers Alliance of New England 2013-2014, and as a certified Arbitrator for the Better Business Bureau.